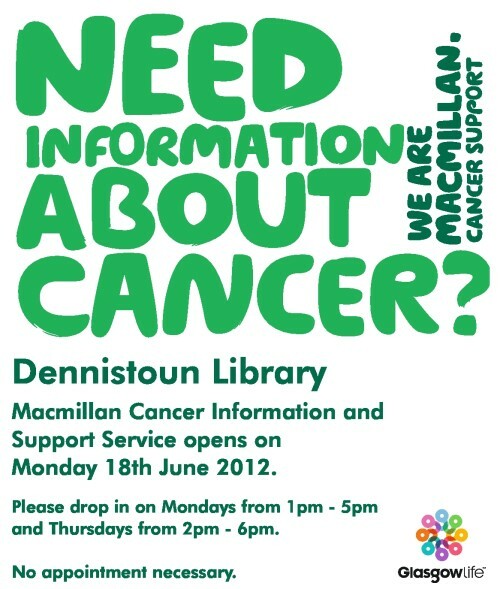 In conjunction with Glasgow Life, Macmillan are opening a new Cancer Information and Support Service within Dennistoun Library. The service will commence on open on Monday 18th June 2012 and be run as a drop in on Mondays from 1pm to 5pm and on Thursdays from 2pm to 6pm. No appointments are necessary. They will be able to offer information on all aspects of cancer, including finances. They can also arrange expert benefits advice from the Macmillan benefits team and complimentary therapies from Cancer Support Scotland. The aim is to ensure those affected by cancer, their families and carers or those who are worried about the possibility of cancer, have access to high quality information and face to face support within their local communities.